Is it wise to rotate site of insulin injections? 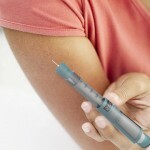 Injection-related skin changes could occur at the site of insulin injections. Thinning (lipoatrophy) or thickening (lipohypertrophy) of the fat under the skin can result from repeated injections at the same spot.